This plaque is extremely difficult to read, especially at the top. 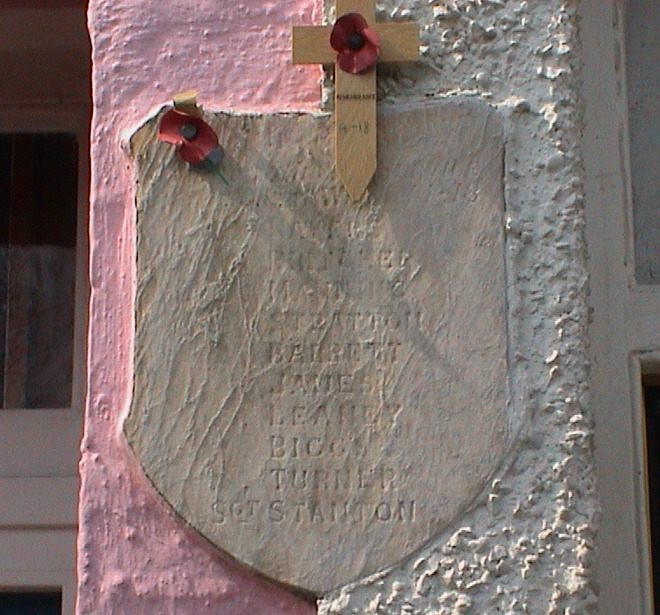 It is also rare, being, as far as one can tell, a private plaque commemorating the fallen in WW1. The residents of the street believe the shield is made of marble alabaster. 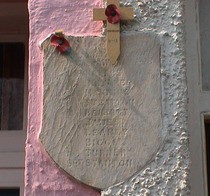 They put poppies on it each Remembrance Day and are appealing for any information about the plaque and the people commemorated. All the named soldiers lived in College Lane, served in the Camden Town-based 19th London Regiment and died in WW1. The Imperial War Museum believes this to be “the only wall mounted memorial in London and only one of three in Britain”. This must be a misunderstanding since there are many WW1 wall-mounted memorials, e.g. St Bartholomew's WW1 memorial and New Court WW1 memorial. Perhaps the word “private” is missing from the IWM’s description of this plaque’s rarity. We certainly agree that this memorial is extremely unusual and if the 10 men really did all live in College Lane, that makes it immensely tragic as well, since the Lane is a short street with not many houses, all small. Our colleague Andrew Behan has researched some of the names and made two sad discoveries: The deaths of Barrett and Biggs left two sisters widows; and Fred Britcher's mother learnt of her son's death in a newspaper. The street at the end of this one, Little Green Street, was the site of the Kinks video for the 1966 "Dead End Street". The house of Sir Jacob Epstein, sculptor, lived and died here, 1929-1959.